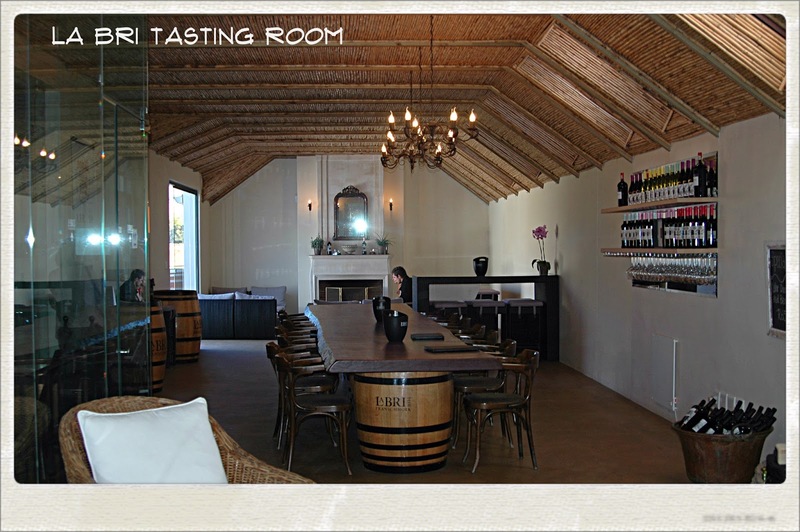 The second stop on our wine tour in Franschhoek, South Africa, was La Bri Wine Estate. Franschhoek is the “French Corner” in the Cape Winelands and La Bri has the distinction of being the oldest Huguenot settled farm in the Cape. The Huguenots were Protestants who fled religious persecution in France and sought sanctuary in South Africa. The name ‘La Bri’ is probably derived from the French for ‘the refuge’, a perfect name for this property, as it is safely nestled in the imposing amphitheatre of the Franschhoek valley. The property was settled by Jacques de Villiers in 1694. 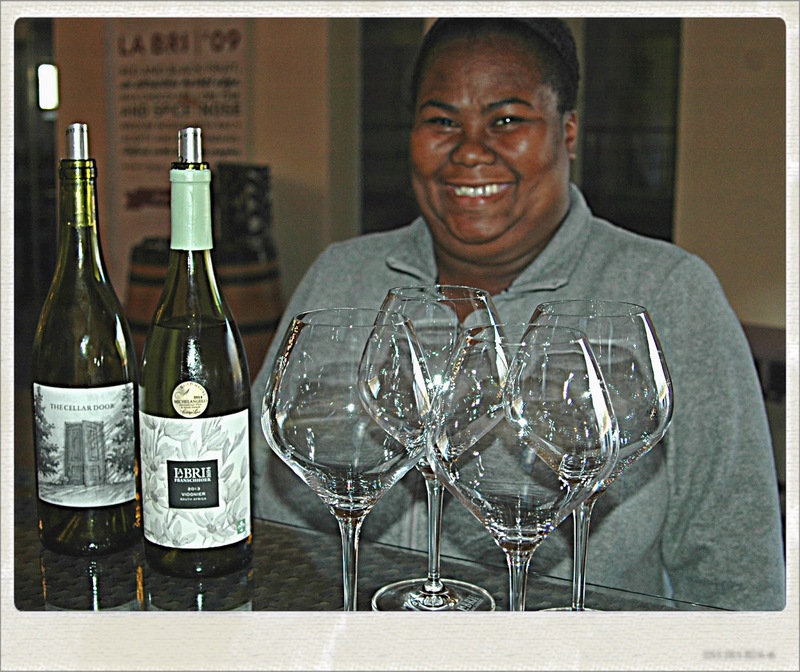 Upon entering the cellar door (as they call tasting rooms in South Africa), we were greeted by Julienne. The tasting room was bright and airy with a thatched roof. Through glass doors was a patio with an incredible view of vineyards and mountains. We were also free to stroll into an area to view the barrel room. We started our tasting with the 2014 Chardonnay. The Chardonnay is naturally fermented and aged in new oak barrels. 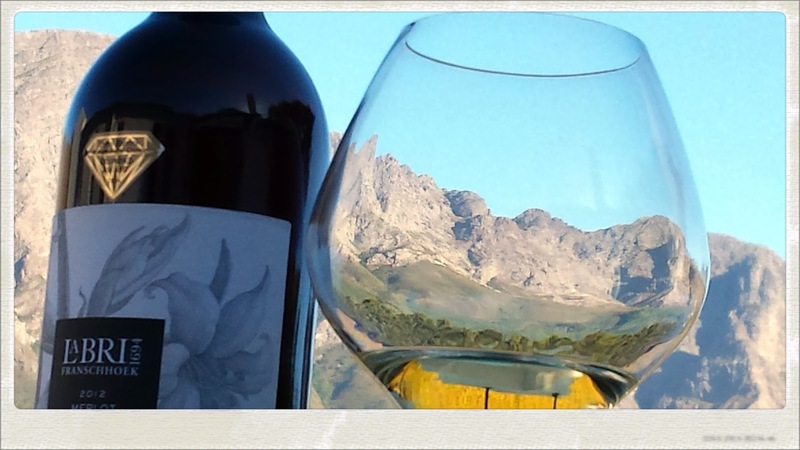 The wine has bright citrus with plenty of acidity and no heavy-handed oaking. Next up was the 2014 Viognier, which is only available at the cellar door. Green Dragon, my wife, commented that she only wanted small pours. Julienne jokingly said, “What are you, a lightweight?” She kept the mood in the tasting fun. As she said, “When you are tasting wine, it isn’t a graveyard or a church.” The Viognier had lime notes and a light floral touch. Speaking of which, all of La Bri’s bottles are decorated with distinctive floral designs. The charge for a wine tasting was 35R (South African Rand) which is about $2.94 US. 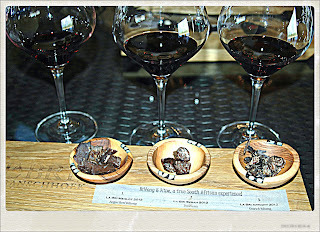 So we decided to go for the paired tastings which included chocolate and biltong. Biltong is a South African favorite, it is like beef jerky, except it includes game like ostrich and antelope. First up was the 2012 Merlot paired with angus beef biltong and a cranberry delight chocolate. This wine is a top award winner and it is easy to see why. It is juicy with soft tannins and a little pop of spice. The second red was the 2012 Syrah. The wine includes 3% Viognier. The Syrah and Viognier were picked, crushed and fermented together. Malolactic fermentation was also used to impart an expansive, full body. It has rich raspberry and herby flavors. We tasted it with Droewors, a coriander seed-spiced sausage. This is a stunner and we decided to purchase a bottle. The bottle is decorated with an illustration of herbs, lest we forget how it tasted! Affinity is a Bordeaux-style blend and the 2012 vintage closed out our red wine tasting. It is a blend of 52% Merlot, 33% Cabernet Sauvignon, 9% Cabernet Franc, 6% Petit Verdot. The color is inky, the flavor elegant blueberry and plum. This paired with ostrich biltong and macadamia salted caramel. Our tasting experience was relaxed and fun. 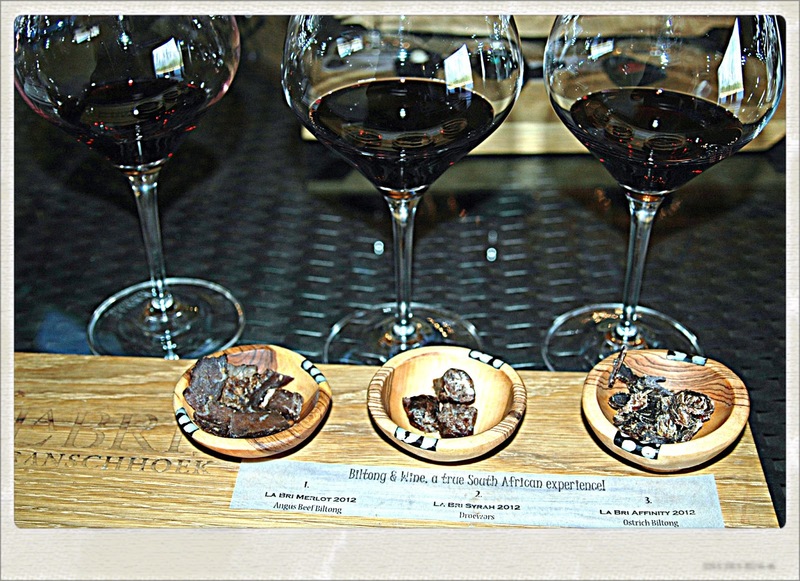 We also met other tasters and in South Africa, you are likely to meet people from around the world. We capped off our visit to this gem of a winery with a Late Harvest Viognier. La Bri produces a limited amount of hand-crafted wines. Its roots are firmly planted in the past, but it continues to make new history with its award-winning wine.